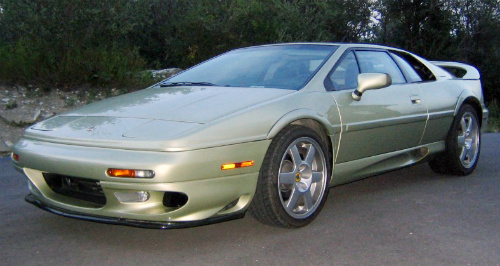 The Lotus Esprit V8 sports car was launched in March 1996 at the Geneva Motor Show, and was seen as the replacement of the Series 4 Esprit and the Sport 300. After years of much thought since the mid 1980's, Lotus finally decided to fit a V8 engine into the Esprit's mid-engined chassis, together with a new interior, uprated clutch, improved gearchange, and a modified rear wing that was now mounted higher up. The need for such a change had its roots in new tighter emission control regulations in the US the result of which would have, almost certainly, prevented the existing 4-cylinder Turbo variant from complying. It was powered by a Lotus 3.5 litre, 32 valve, V8, all aluminium, twin turbocharged engine, using Garrett T25/60 turbos. This engine, developed by Lotus, was designated the Lotus 918, and produced 350 bhp, with a top speed of 175 mph, a 0-60 mph time of 4.3 secs, and a 0-100 mph time of 10.1 secs. This was a huge improvement over the 4-cylinder Turbo, and positioned it on a par with its arch rivals the Ferrari F355 and Porsche 996. The 918 engine originally developed 500 bhp, but was detuned to 350 bhp in order to prevent damage to the Renault transmission linkages, which were not able to cope with such output. It was fitted with the same Renault five speed gearbox as previously, but no charge-cooler (intercooler) was added. It retained the same ABS braking system, sported even larger wheels, and proudly displayed a V8 badge next to the rear lights. The wood and leather interior was replaced by a more minimalist approach, including the use of push buttons within a redesigned centre console. However, it still retained, from previous models, a necessary struggle to enter or leave the car. Rear vision was still poor owing to the size of the rear spoiler. In late 1997, the V8 sports car was presented in two slightly different specification formats, designated the Special Equipment (SE) and GT models. The performance of each was virtually unchanged, with both displaying a restyled interior. However, the SE variant was offered with more luxurious appointments. In October 1997, the Lotus Esprit V8 GT sports car was introduced at the London Motor Show. It was powered by the same engine, and offered the same stunning performance as the V8, but without some of the more luxurious fitments, such as leather seats and air conditioning. As a result, its weight was reduced by about 50 kg, and the price tag was lowered by around £10,000, which made it much more attractive at just under £50,000. Also in October 1997, the Lotus Esprit GT3 sports car was introduced as an entry level Esprit, and with the luxurious fittings present in the V8 variant having been removed. It was powered by the same Lotus 920, 2 litre, 4-cylinder, turbocharged, charge-cooled engine, that had been used in previous models targeted at the Italian market. It developed 240 bhp at 6250 rpm, and 216 ft/lbs of torque at 3750 rpm, with a 0-60 mph time of 5.2 secs, a 0-100 mph time of 12.9 secs, and a top speed of 162 mph. A 1996-97 Lotus Esprit V8 in very good condition would command in the region of £22,000/$35,000 to £30,000/$50,000.